A fine pair of cast-iron tazza form urns with fluted foot and scalloped rim, English, circa 1930. Measures: 13 ins. high, 22 ins. overall diameter; plantable area 6 ins. deep, 15 ins. diameter. 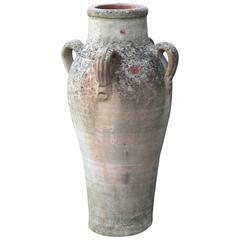 A four-handled terra cotta olive jar, Italian, circa 1950. Measures: 30 ins. high, 15 ins. overall diameter; 5.75 ins. diameter of opening. Heavy iron urns with beautiful rusted patina. 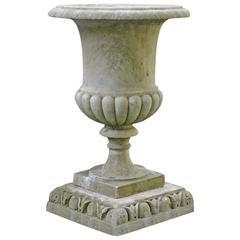 2 similar cast style garden urns with gadrooned edge, fluted body on pedestal base with alligatored remnants of old paint. Keyword: planters.